Anyone who has seen the Abraham Lincoln statue that anchors the Maxwell courtyard can’t forget it. But who is this Lincoln, and where did he come from? If you are ever in Jersey City, N.J., set your GPS for the corner of JFK Boulevard and Belmont Avenue. But don’t turn onto Belmont. Go the other way, into a modest divided parkway heading west. What you find there may surprise you. Sitting on a grand circular pedestal, centered in a granite exedra and flanked by low, inscripted abutment walls, is a statue of Abraham Lincoln. He is seated, pensive, gazing down toward the ground or toward you, the viewer, but seemingly so deep in thought as to notice neither you nor the turf. Except for its almond-brown patina, this could be the same Lincoln statue that sits in the grassy courtyard outside Maxwell Hall. In fact, it is. Completed in 1930, this Lincoln is the original. Syracuse University owns the only full-sized bronze duplicate. Each February, locals gather by the Jersey City statue to mark Lincoln’s birthday. Otherwise, the statue goes largely ignored. Its neighbors are nondescript, mid-sized apartment buildings that do not face it. Though noisy traffic rumbles by on JFK Boulevard, few cars turn into this parkway; sidewalks along its outer edges do nothing to encourage pedestrians to enter the median. In a nearby park, joggers and softball players are stumped when asked for directions to the statue. In Syracuse, scarcely a day goes by when someone doesn’t approach the statue for a photo or just a better look. It is one of the University’s most photographed features, and it is especially well-loved by citizens of Maxwell, who tend to think of it as their own. The story of how it came to be is the story of zealous Lincoln­ites in the Garden State 80 years ago. The story of how it reached Maxwell is the story of an expanding university attempting to bolster its research holdings. And the story of why you always remember it is the story of the sculptor, James Earle Fraser. In 1927, the New York Evening World reported that the Jersey City memorial committee had selected an artist. James Earle Fraser was the creator of the buffalo/Indian head nickel and “End of the Trail,” already an iconic piece of American sculpture, depicting a dejected, exhausted American Indian atop a similarly exhausted horse, possibly at the end of a forced exodus. “End of the Trail” was then sitting in San Francisco, near the western terminus of the Lincoln Highway. “I don’t believe I have ever had a more enthusiastic feeling toward doing any monument than I have for this one,” Fraser reportedly told the committee. In some respects, Fraser was an obvious choice. He was America’s leading sculptor of public, monumental art, responsible for the Alexander Hamilton at the federal Treasury Building; statues of Lewis and Clark and Thomas Jefferson in Jefferson City, Mo. ; and a well-received statue of the inventor John Erickson in Washington, D.C. But one wonders whether the good folks of Jersey City understood what they were buying. Many of Fraser’s statues are assertive and idealized, such as the brio-drenched Teddy Roosevelt outside New York’s Museum of Natural History. However, as “End of the Trail” demonstrates, Fraser was sometimes tempted to reach for subtler, darker attributes. Whereas the Lincoln Memorial in Washington (by Daniel Chester French) captures a noble, almost stolid president, apparently certain of his place in history, the Lincoln that Fraser envisioned is contemplative, worried, melancholic. Fraser told the Christian Science Monitor, “I particularly wanted to make a sympathetic and human study of Lincoln. There are so many presidential Lincolns that I have hoped I might create something that would give an idea of his outdoor personality. According to some reports, Fraser had prepared a Lincoln five years earlier—a model viewed by an art patron who was considering Fraser for just such a commission. 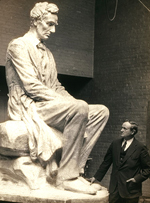 Fraser told the patron, “It is a thought I have had in mind for some time, and I believe a little different from any statue of Lincoln which has been produced.” However, the commission was never made and there is no description of the model to provide comparison with the Lincoln that came to be. Through the years, some have claimed the statue depicts an actual moment. The story—allegedly related to Fraser by Lincoln’s former private secretary, John Hay—is that in the early days of his presidency, Lincoln would slip out the back door of the White House at dusk and climb a nearby hill, where he sat and considered his challenges. Historian F. Lauriston Bullard contested this notion, asserting that, even in the mid-19th century, no president could simply wander the hills outside Washington, searching for a nice place to sit and reflect on the day. Plus, that Lincoln would have a beard; Fraser’s is beardless. In any event, Fraser created a Lincoln whose emotions are complex, whose visage is nuanced and deeply affecting. James Earle Fraser was born in Minnesota in 1876, but his father, a railroad contractor-engineer, soon moved the family to Dakota Territory. Fraser met frontiersmen. Indian children were his playmates. For a time, the family lived in a railroad boxcar, the children sleeping on its floor wrapped in buffalo skins. In 1902, Fraser set up shop in New York City. Among his first public commissions was a bust of Theodore Roosevelt for which Saint-Gaudens had been commissioned but could not execute. He sent his former student. Roosevelt was at first incredulous that the young Fraser was up to the task, but accepted Saint-Gaudens’ faith in him. The bust was considered a near-masterpiece, capturing the Rough Rider’s pluck, and was moved to the Senate chamber. Fraser’s first major public statuary was the Alexander Hamilton outside Treasury; for the rest of his life he would never be without a public commission. In addition to those already mentioned, Fraser sculpted the scenes, in relief, on the Michigan Boulevard Bridge in Chicago; various pediments for federal buildings, including Commerce; the two heroic figures in front of the Supreme Court; numerous medals; monumental allegorical figures such as Victory in Montreal; statues of Thomas Edison, Thomas Jefferson and General George Patton (at West Point); and many, many others. Some are straightforwardly heroic, such as the 60-foot-tall, perfectly erect George Washington prepared for the 1939 World’s Fair. Many included a dash of personality, such as a wise, beneficent Ben Franklin sculpted in 1938 for Philadelphia’s Franklin Institute. Few, though, harbor the gravitas of either “End of the Trail” or “Lincoln the Mystic.” As the former somehow embodies the fate of the American Indian, Fraser’s Lincoln seems to capture, in the president’s troubled gaze, the daunting passage America faced on the cusp of civil war. In the early 1960s, Syracuse University was completing its transition from the small Methodist liberal arts college it had once been to a teeming, multi-faceted research university. Chancellor William Tolley and others grew aware, though, that the research holdings of the University were not at the level of a great university. At the same time, the dean of the School of Art had instituted a “museum without walls” program by which more art would not only come to campus but find an audience in public spaces. In 1963, Martin H. Bush, an instructor in Maxwell’s history department, was named assistant dean for academic development, with broad purview to track down papers and artwork. Over seven years, he approached dozens of accomplished figures—authors, actors, architects, politicians, generals, poets, artists, cartoonists, athletes—who, he imagined, might donate their papers, correspondence, and other ephemera to the University. There were many notable acquisitions at this time—for example, the Sacco and Vanzetti mural by Ben Shahn found on the eastern end of Huntington Beard Crouse Hall. At the end of an astonishingly prolific career, Fraser had died in 1953. His wife, Laura Gardin Fraser, also a well-respected sculptor once the subject of a solo exhibition in Syracuse, then died in 1966. According to an account in the Westport (Conn.) News, plaster casts from the Frasers’ studio then began showing up at the dump in Westport, where the artists lived and worked. The executor of their estate was Laura Fraser’s sister, Leila Sawyer. Bush somehow learned of the Frasers’ studio and soon arranged to have the entirety of both Frasers’ papers, books, photos and more than 500 pieces of artwork come to SU, along with a $50,000 gift from Sawyer to help transport and maintain them. A portion of those materials was, in turn, sold to the National Cowboy & Western Heritage Museum in Oklahoma City. (The plaster version of “Lincoln the Mystic” displayed there is the original from which the two bronzes were cast.) SU retains today the world’s most extensive collection of Fraser materials, including dozens of pieces of sculpture, many of which are studies or enlargement stages for eventual well-known works. When the Fraser materials were acquired, someone decided to recast “Lincoln the Mystic.” Who and why is not entirely certain. Other pieces in the collection were being cast for a Fraser show at the Kennedy Galleries in New York; that may have been a factor. There was, as mentioned, a push to place public artworks on campus and, in Sawyer’s gift, a stipulation that SU help perpetuate the Frasers’ legacies. But no one knows for certain how it was decided that this piece—rather than, say, “End of the Trail”—would get a new home at SU. The statue was installed on Dec. 13, 1968, with no fanfare. A truck and crane pulled up, and the 2,700-pound, nine-foot-tall statue was set onto its concrete pedestal while a few passersby stopped to gawk. No one who was with Maxwell then remembers any ceremony—just a University-generated notice in the Daily Orange and local newspapers, in which the art critic Lorado Taft was quoted: “The statue marks the beginning of a great life …. It shows [Lincoln] in his younger days of poetic vision, of promise rather than fulfillment.” There Lincoln sits today, much admired but rarely discussed. Few who have passed through the Maxwell School since 1968 ever forget the look on the face of their special Lincoln.